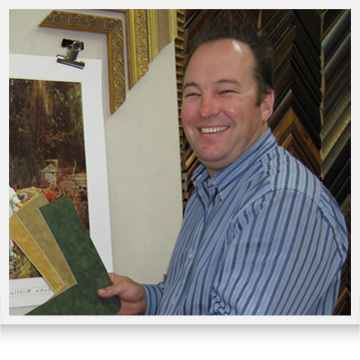 David Schummy, owner of Fix-a-Frame, has taught picture framing classes at TAFE and privately since 1991. In 1995 he was contracted by VETEC to write 16 of the 22 modules used to train picture framers nationally. He has taught 14 apprentices and over 1200 individuals how to make frames. You can order and download the workbooks from the online store and if you want to register your interest for any up coming seminars or workshops please send us an email expressing your interest. Please join the Framer's Club for regular live training and other bonus content. If you have any questions regarding picture framing or would like to purchase framing equipment or supplies please contact us. We keep an extensive range of products for picture framing at our Mt. Gravatt showroom. Online you can purchase chopped frames that are ready to join using a simple thumbnail that we provide. All the bits and pieces, matboards, foamboards, glass and acrylic is available in store or you can purchase a selected range from our online shop. Our chop service provides you with the easy way to purchase picture frame mouldings. Lengths of picture framing are pre-cut to sizes of your choice. Mitres are routed to accept thumbnail wedges, then slotted at the mitre so you can join your frame with a special wedge which is provided. The chopped frame is then dispatched to you. Fix-a-Frame has an extensive range of "nik-naks". All those things that picture framers keep to themselves, like... "D rings", "V nails", turnbuttons, felt bumpers, push points...in fact just about every little fitting or accessory available. Have a look in the sundries section of our online shop. If you require professional production equipment please contact us or have a look at our favourite links to find equipment wholesalers.